Is there anything better than pot roast on a cold evening? I think not. 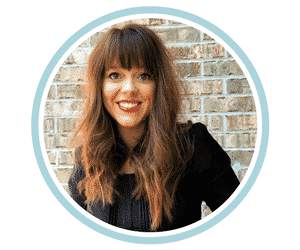 It’s filling and warms you from the inside out. 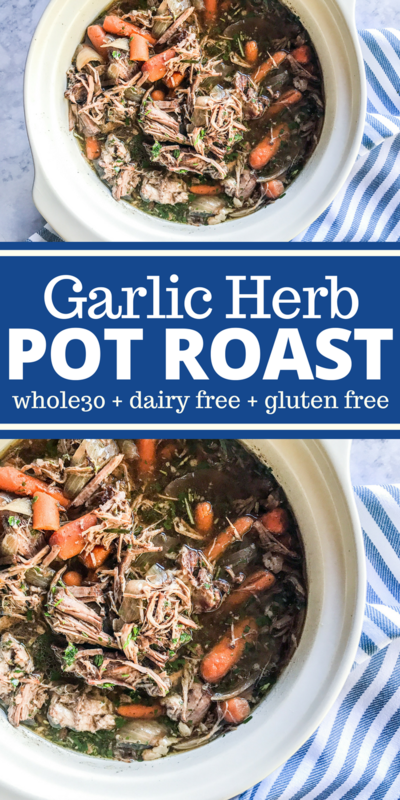 If you feel the same you’re going to love this Garlic Herb Pot Roast. Now a pot roast traditionalist (is that a thing?) will probably tell you to cook your potatoes with the meat. I may lose some friends here but I have to disagree. My favorite part of pot roast is all that yummy gravy and it feels like a waste to not serve everything over creamy mashed potatoes. I prefer to prepare my potatoes separately and mash them. Don’t worry, I have a recipe for that too. So make the mashed potatoes and then ladle all this pot roast goodness right over top! In this pot roast I add apple juice. It adds a hint of sweetness and another layer of flavor to this already complex and luscious dish. I have used cherry and pomegranate juice in a pinch too and both work great. The end result is totally delicious. You’ll have lots of yummy gravy. Plus the whole thing is Whole30, gluten free, and dairy free! 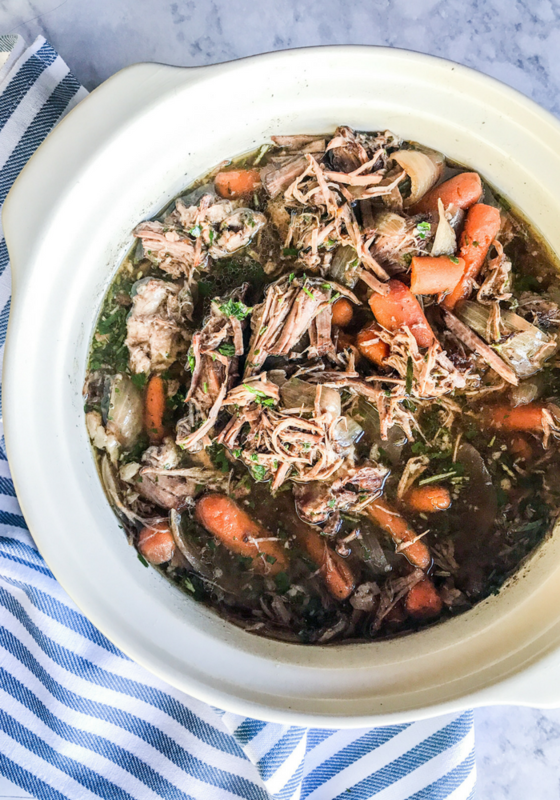 Warm the whole family on a cold day with this delicious slow cooker Garlic Herb Pot Roast. You'll really love it over mashed potatoes. Plus it's Whole30, gluten free, and dairy free! Add cooking fat of choice to a large pan and heat to high heat. Place your pot roast in the pan once hot. Brown on both sides. Approximately 3-4 minutes per side. Place your browned beef in your slow cooker. Add all other ingredients. Stir. Cover and cook on low for 6 - 8 hours. 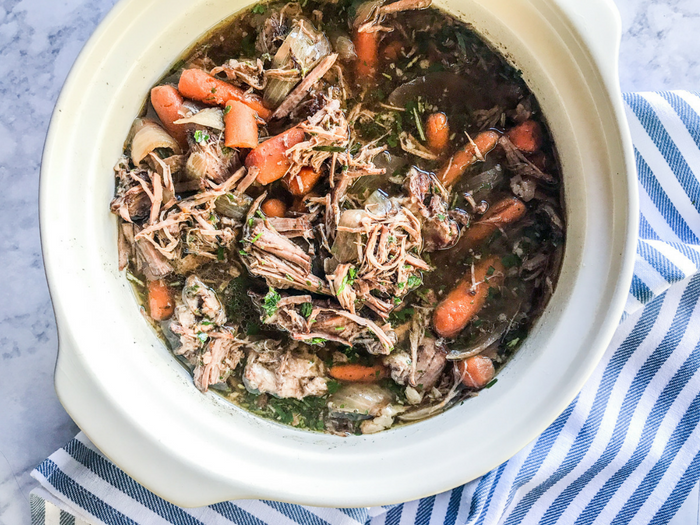 Shred or slice finished pot roast and add back to the slow cooker. 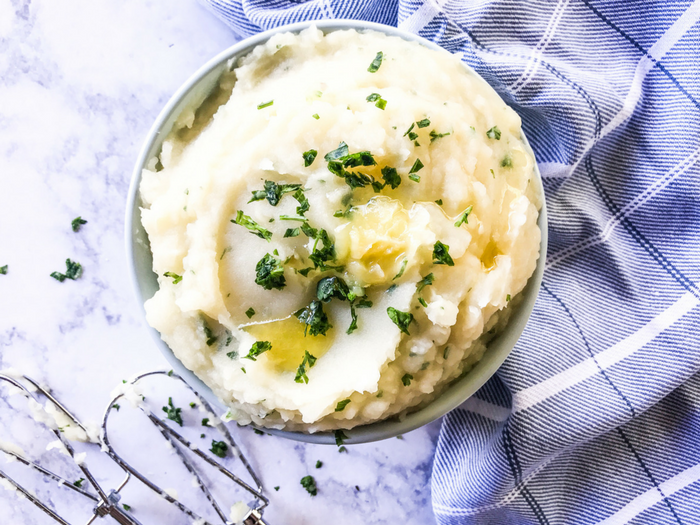 Serve over creamy mashed potatoes and top with fresh parsley or thyme. I went for it! Cooking now and smells so good. Can’t wait to try it!